J. Horace Lacy’s Chatham Quarters? Considering the length of this discussion, it will be divided into two parts. In 1860, James Horace Lacy owned 550 improved acres and 250 unimproved acres that comprised his Chatham plantation in Stafford County, Virginia. The 1860 Slave Schedule lists 39 slaves in Stafford County that belonged to Lacy. 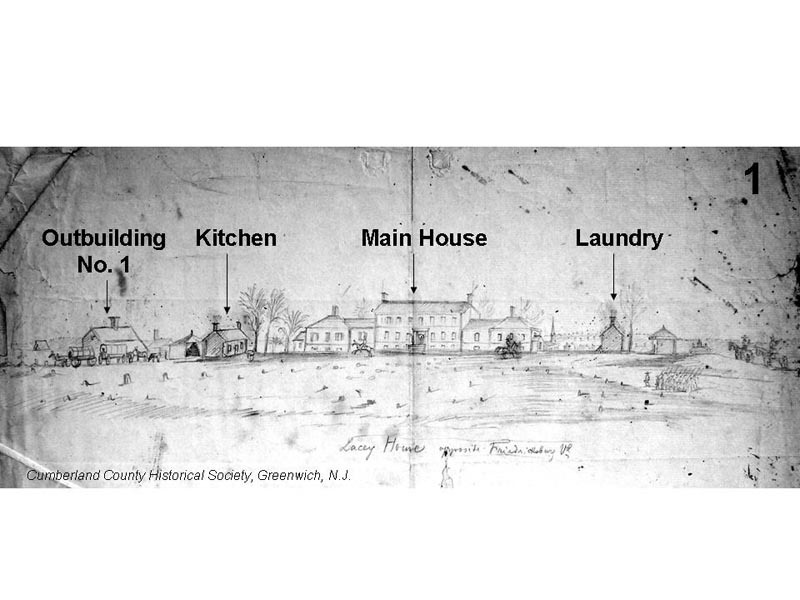 The census enumerator also identified six “Slave houses,” as part of Lacy’s holdings. Since 1975, the National Park Service has owned and maintained Chatham. Today it includes a number of structures, dating from the 18th through 20th centuries, on 85 acres. 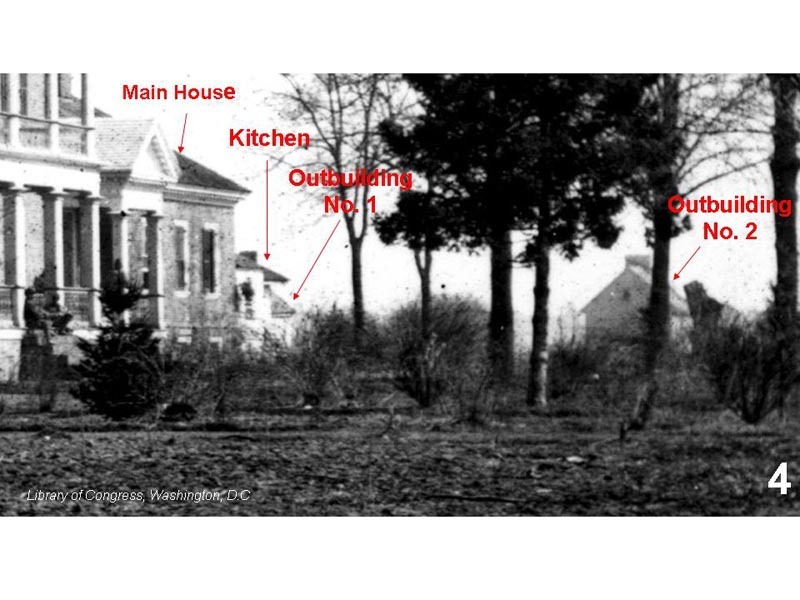 Chatham, as an antebellum plantation, was obviously based on slave labor and at any given time the slave population greatly outnumbered the other residents, yet the location of quarters and houses for the slaves has remained unknown. No known or documented slave houses remain on the Chatham landscape. The location of slave buildings could be determined through a number of sources: maps, photographs and artwork, written descriptions, and archaeological investigations. All known maps, however, fail to identify slave quarters at Chatham, and no known written descriptions of them have been found. Cursory archaeological surveys have also failed to locate possible locations for slave quarters at Chatham. Photographs and sketches, on the other hand, may provide us with some clues. 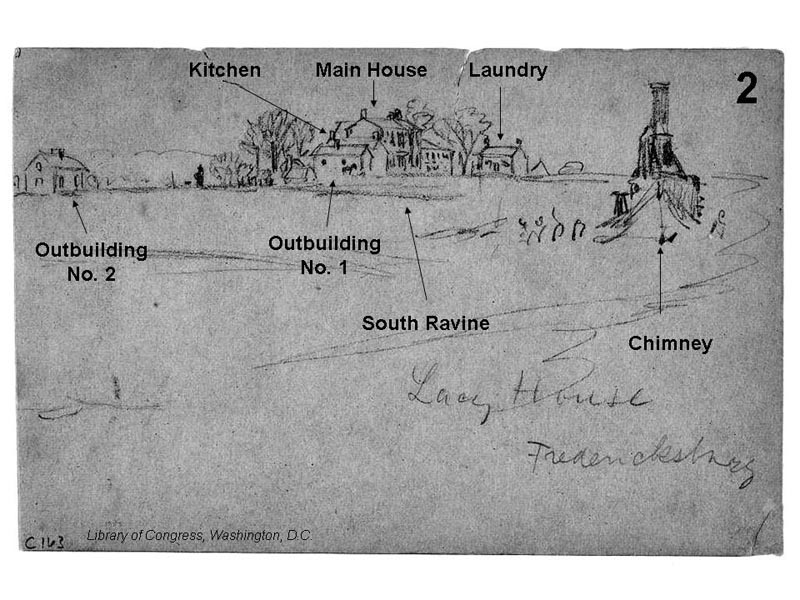 The first image presented here is a sketch, made by a Union soldier, during the winter of 1862-1863. It depicts the Lacy House as viewed from the rear – looking at the eastern façade. The only structures that survive today are the main house, kitchen and laundry. Note the structure depicted to the far left – one and a half stories with a central chimney. For the purpose of this discussion, it will be called “Outbuilding No. 1.” It appears to the rear, or south, of and oriented parallel with, the kitchen. 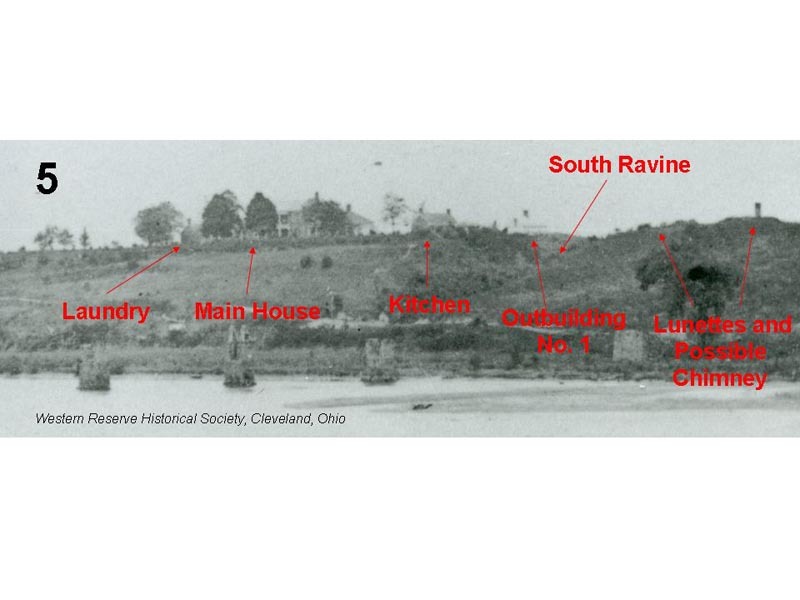 The central chimney suggests a habitable space and perhaps may have been living quarters for slaves associated with the main house and its ancillary structures. The second image is another sketch from the winter of 1862-1863. This view is once again looking at the rear of Chatham, but from the southeast. The kitchen, main house and laundry are visible, as is Outbuilding No. 1. The south ravine that cuts behind these last two structures is represented by some slight shadowing. A slight distance from the main plantation complex is another small one and a half story structure, with a central chimney, that appears at the far left of the sketch. This structure, which will be called “Outbuilding No. 2,” appears to be oriented parallel to the ridge upon which it stands – its gable end facing the main house. The represented openings and central chimney suggests a living space. To the right is a chimney that appears to be free-standing with perhaps a soldier’s tent attached to it. This represents the ruins of a structure. Image number three is a widely published photo of Chatham, taken during the winter 1862-1863 period. The perspective is looking south across the front of the main house, showing the western façade of the building. A closer examination, shown as image number four, reveals some of the other structures off the south wing of the house. The rooflines of the kitchen and Outbuilding No. 1 are barely visible behind the main house, while a third structure appears through the trees to the right. This is likely another view of Outbuilding No. 2. It is a one and a half story, whitewashed building, possibly clad in clapboard siding, with a central chimney. 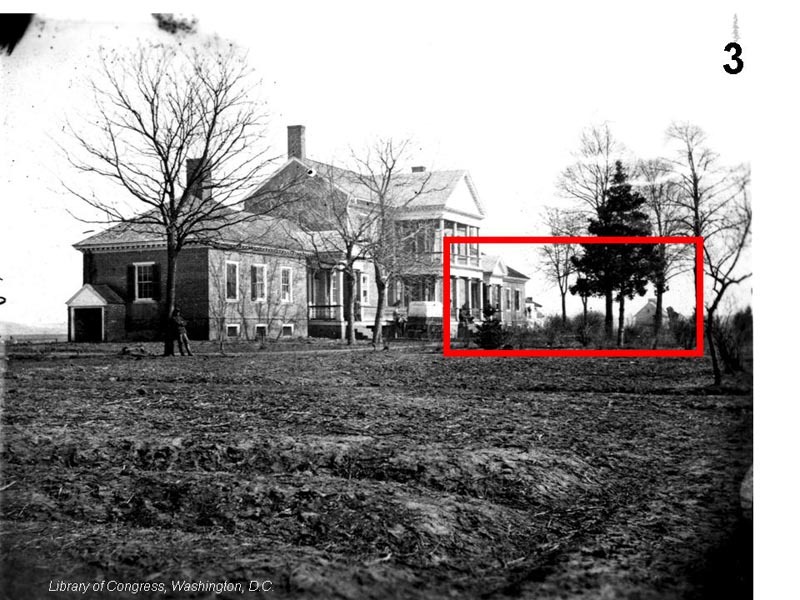 The final image is an 1864 photo, looking at Chatham from across the Rappahannock River in Fredericksburg. The main house, laundry and kitchen are clearly visible, as is Outbuilding No. 1, which appears to also be a frame, whitewashed structure. The south ravine is seen cutting to the south of Chatham, emptying into the river. On the property south of the ravine are seen the artillery lunettes (earthworks constructed as protection for cannons) built just prior to the Battle of Fredericksburg. A tall slender object appears rising from behind the lunettes. Outbuilding No. 2 does not appear in this image. Perhaps this object is the remnant chimney of the now razed structure. Excellent detective work here Mr. Mink. The 1864 image is a tremendous find. Great post Eric. Congratulations to all of you on getting this site up and running. I absolutely love the focus. My $.02 worth is that, in my experience, the 1.5 story clapboard buildings with a center chimney are usually for domestic slaves and usually located near the “big house”. As for the field quarters, it’s my understanding that they were located near the crop fields and away from the house, so as not to be seen or heard by the master and family.